I would think there is not a person alive that doesn’t have a memory they would like to get rid of. For me, I’d love to be able to look at pictures of my godson. I cannot even look at his baby pictures without having flashbacks, but occasionally I wonder if it is my version of Paul’s ‘thorn in the flesh’. What good are these bad things in our heads? The strength of our character endures beatings and tempering like a sword being crafted in a blacksmith’s shop. James 1: 2-4 says that the testing builds perseverance that builds maturity. In Romans 8: 18, Paul writes that our present suffering cannot compare to the glory that is coming. Verse 37 goes further with Paul saying ‘we’re more than conquerors in Christ’. Do you know anyone who has not been hit by reality? Untested, we don’t know what they are made of—aluminum that wilts in the heat or titanium that flexes under pressure. Those tested have the inner resources and experience to lift up the hurting. They can identify with the struggles and provide more than platitudes. Spoiler alert, my current book project centers on redemption and rebirth. It took me realizing I was helpless before I would cry up to God. He answered and it was months later that I realized how. I watched as things began to fall into place where it shouldn’t have been that easy. Who needs God when everything is going our way? Few can hear the whispers, or respond to the nudges; however, when it all goes downhill and we realize we don’t have the answers, we can hear again. 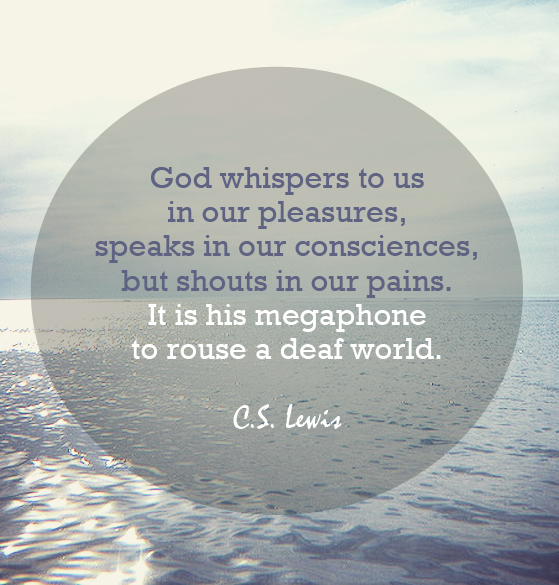 Our comfort weakens us. It causes us to lose perspective. A prevalent ‘gospel’ out there is the prosperity gospel. It teaches that God wants us to be happy. The problem is happiness is based on circumstances. Joy is a fruit of the spirit, not happiness. It also teaches God wants you to be wealthy, just plant a seed and money appears. It is a very commercialized message that is far from the truth. Jesus taught about storing up treasures in Heaven, not here. That isn’t to say poverty equals holiness either, that is the idea that material things are unspiritual. God created the material world, and he wants us to enjoy material things but not owned by them. What Jesus wants from his followers is in Matthew 28: 19-20. Tell the world about him and teach them his ways. Our funds are just another tool to help make it happen. Our time is as important too. Like taking the training wheels off your kid’s bike, sometimes God takes parts of our lives away so we can grow. Jesus said as much after the Last Supper in John 15. I have had two things removed in my life. My Saturday afternoon martial arts class and a business I was a part of. They keep us humble, allowing God to work through us. Can you do something if someone is in your way? It is the same with God. He’s willing to let us do it on our own. It’ll carry us as far as our strength and talents can take us. Paul was a Pharisee who learned from one of the great rabbi’s in Judaism. On his own, he came far and it led him towards self-righteousness. In 2nd Corinthians 12: 6-10, he admitted he had a “thorn in the flesh”. We never learn what it was exactly, though it seems to be painful enough that he begged for it be taken away. The answer he received was ‘No’. God did give him an explanation though in verse 9; “My grace is sufficient for you, for my power is made perfect in weakness.” It was there to keep him from becoming conceited. I have the same problem as Paul. It’s easy for me to become arrogant. When that happens, I start to operate on my own strength. It makes things like being friendly to strangers or patience with people that annoy me harder. When I get out of the way, I just ride the wave of His strength and it becomes easier. Would you go back and stop your own trials?